The Six Figure Mentors Review, I Will Be Honest! Are you looking for training to be an affiliate marketer? Learning a solid foundation to owning an online business can create a substantial second income. Have you come across a program called The Six Figure Mentors? I would like to give the Six Figure Mentors review of this platform, updated since some significant changes as of June 2018. I have done a considerable amount of research and would like to share it with you. It can be so difficult to discern who is trustworthy and who’s not. I have been burned a couple of times trying to find the right fit for myself. Many promise the moon and stars, but all they really want is your money. It’s certainly been a learning curve for me. I’m so pleased to see you researching these programs before buying into them. You’re a smart person, being careful with your time and money. My wish is that this review will help you make an informed decision that’s best for you! I did finally find the perfect online learning platform. If you’d like to read about it now, please CLICK HERE. 3 Who Is This System For? Before we begin, do you understand what an affiliate marketer is? 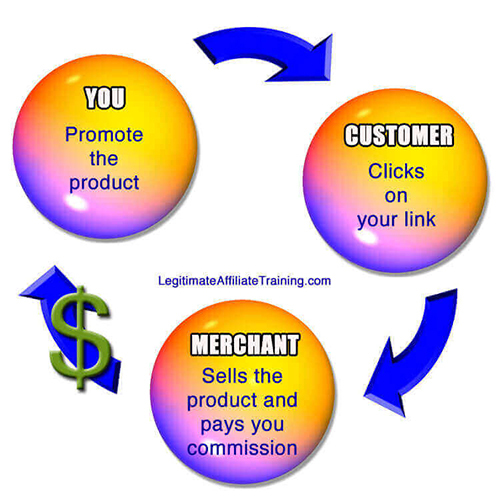 Affiliate marketing involves 3 people…the merchant, the affiliate (You) and the customer. The affiliate recommends a product to a potential customer for an agreed upon commission if the product is sold. In other words, when your customer buys a product using your link, on your website, they’re sent to the merchant to complete the sale. Once completed, the merchant pays you a commission for the sale. It’s an online business that you own and can be very lucrative. The Six Figure Mentors is co-founded by Jay Kubassek and Stuart Ross. Jay initially collaborated on a previous program called Carbon Copy Pro, which was then changed to Pro-Elite. They proclaim to have now designed a program to show you how to be an effective affiliate marketer with cutting-edge tools and support. They claim to help existing business owners who may want a boost to their current strategy, as well as offer an advanced affiliate system with life-changing commissions. I must say this is where my “red flags” were raised. The advanced system is their high-ticket items, which you are required to purchase if you want to get commissions for promoting them. It’s a tier system. Sound familiar? Yup, it’s an MLM structure. I signed up as an affiliate in order to get inside to see what they offer. But all I gained was a very limited dashboard. Every time I clicked on a product, it brought me to a video trying to convince me to upgrade, lol. Well, sorry folks, I wasn’t willing to pay that much money to check it out? Six Figure Mentors used to have four levels of membership plus an elite academy. As of June 2018, they have restructured their memberships down to two, and renamed their five high-ticket upsells. If you want to compare to the previous costs, CLICK HERE to view. Essential Membership – $297 + $97/month. The previous Digital Skills Platform has been phased out and replaced with the “Lynda Course” database. Similar to Udemy courses, you can pick and choose which courses you wish to watch. This is an image of their description of the Essential’s membership when you wish to upgrade on the personal dashboard, inside. Six Figure Mentors is designed for both beginners and experienced marketers. The Introductory Membership is primarily the cost of applying with an intro to online marketing as well as convincing you to buy their big-ticket items. There are no actionable steps here other than to upgrade. I believe as a beginner, you’ll get the basic information needed to set up your business with the Essential membership. You will get to advance your training using video classes from Lynda.com. Unfortunately, this might be scattered with overlapping training at times. For the more experienced marketer, you have the option of creating an additional income stream by promoting the high ticket items. Unfortunately, you have the pay the thousands of dollars to purchase them before you can promote them. Before applying for any membership, you must fill out an application form to ascertain your willingness to sell their products, if you can afford them, and your monthly budget. They say it is to ensure you are a good fit for their community, and if they don’t accept you, you will be refunded the $29.95. You will also book a consultation with one of their business strategists. A past member claimed to have had to schedule a Skype call to be interviewed for his “suitability” to advance to the Elite membership. I can’t confirm this, but you could view this either way; a roadblock, or an honest conversation about your desires and finances. This might seem somewhat intimidating, but I guess if you’re willing to spend this much money on a product, you’ll want to make sure it’s for you, lol. Once you’ve upgraded to the Essential membership (because you can’t do anything with the Introductory membership), the dashboard will show you the five training modules as well as your resources and training (Lynda). SFM also has an affiliate program. The commission structure is a fairly basic one, offering you a generous commission on the membership sales, but quite a small amount on the high ticket items. You can apply to be an affiliate for free, but get nothing but your links. As you can see at the bottom of the image, there’s also a referral commission program, which is their tiered system of payment, like an MLM business. To read about MLM vs. Affiliate Marketing, CLICK HERE. Member feedback seems to be divided. The system works for beginners with no knowledge of internet marketing, but those with some knowledge find there are too many time-consuming roadblocks. You can’t move forward without performing each task. And no useful information until you’ve joined the elite membership. There is also the problem of market saturation. Their Simple Lead Capture program offers ready-made landing pages, but unless they are revised or changed every so often, the market you promote to will become saturated with the same ads. Also know, that these landing pages are designed for their products only. You won’t be able to use them for your choice of products outside of SFM. This method of affiliate marketing is called email marketing, and it’s not as easy as they make it seem. In order to get any number of sales, you require a very large email list. This can take a very long time to build unless you have a massive following on social media. This system is very similar to Inbox BluePrint 2.0 by Anik Singal, but ridiculously more expensive, lol. required to provide personal information such as monthly income, etc. I believe this is a legitimate platform but with it high membership costs. One of my biggest concerns is the number of times I read about them asking you to sell their products. There’s nothing wrong with this unless the majority of the training revolves around this. I’ve already seen their pre-made landing pages which are for selling their product. 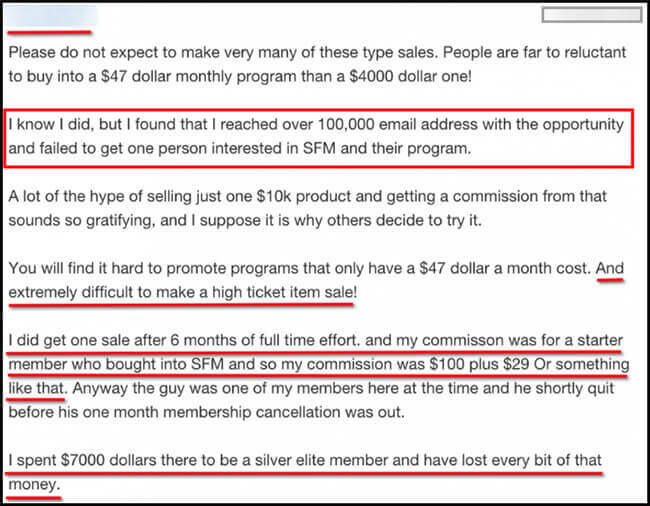 The affiliate commissions for their product sales are OK, yet they discuss their affiliate commissions being life-changing. This tells me that there is probably a big push to sell their high ticket items. 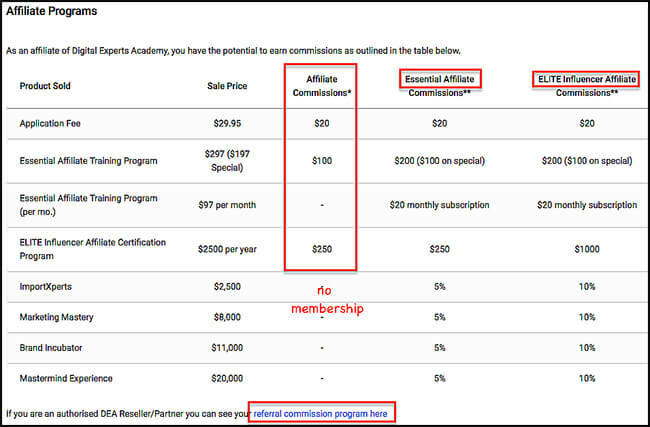 Compared to the small commission amounts of the affiliate program, their tiered system is where you can make more money. But the only problem with the MLM business style is that you have to keep working to add to your downline. You will also have to work hard at motivating them. Will you be hounding your friends and family? This is what I hate about any MLM business!! I also came across negative reviews about spending a lot of money and not making any. This I believe because promoting high ticket items is very difficult. You have to target the right audience, which isn’t easy in itself. Here is one such review. This was earlier in the year before their name and price changes. And what if they suddenly disappear? No joke! It’s happened before with other systems. There go your made-for-you material and your income. That’s what happens when your business is dependant on someone else’s. This is why owning your own online business is so important. No one can take it from you. And to do that, you need to seek out a training platform that offers us a solid foundation for success. The alternative I mentioned is called Wealthy Affiliate. It’s a platform that provides you with an excellent education and all the tools and services you’ll need under one roof. All the training is done in a methodical manner, meaning they take you by the hand from A to Z. There’s no going to another platform to try and figure out what courses you should take. They lay it all out for you, right there. The live community is 24/7/365 and is global with over 1 million members. There are always many members online to answer questions and give support, even at 2:00 am. And the best part is that you can join for free (NO credit card needed), and no application form asking personal questions. If you decide to become a premium member, it’s only $49/month or $359/year. That’s a 40% savings right there. And believe it or not, it includes everything above, and more, but without the exorbitant fees. 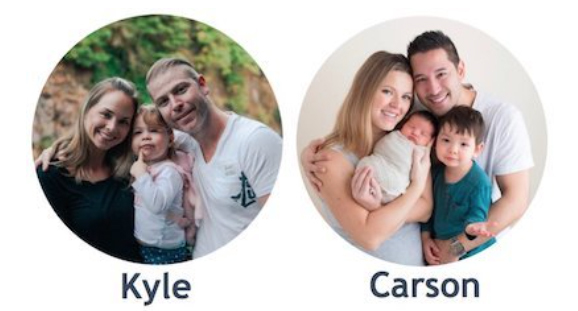 That tells me that the founders, Kyle and Carson, are serious about wanting to help people. Over a million members will agree! So why not give them a try? You have nothing to lose with a free membership….but everything to gain! Once you join, I promise to meet you inside. And I’ll personally help you as long as you need me to. See you soon! Have you discovered programs you’d like to talk about? I would love to hear from you. Please leave me any questions or comment below. And if you know of anyone this would benefit, please share! ← How To Make An Email List Happy – 18 Greatest Tips! You did a great job of exposing this “money grabbing” program and I thank you. I also like your recommendation and I’ll be back to dig in deeper on it. Hi Terry and thanks for commenting. I’m happy you prefer my recommendation. It’s certainly a wonderful place and so much cheaper lol. If there any more information I can help you with, please contact me. I was with SFM for 1 year as an Elite member. I was a newbie and found the initial step by step module training really good. But then it came to a screeching halt and you were expected to choose the training you needed from their extensive range of video training. But when you’re a newbie, you don’t know what you need. I couldn’t see the big picture so I ended up feeling very overwhelmed and lost. I went from one training to the next. I belonged to an SFM Facebook support group but getting information could be difficult because it was like everyone was competing for attention. The other thing I didn’t like, was being limited to promoting their products only. This is extremely restrictive and as you’ve said, you become reliant on SFM for your business. I am much happier now, having my own niche website. Great review. Hi Tanya, and thank you so much for sharing your experience with SFM. You’ve confirmed my suspicions. The initial training is great, but then they hold you hostage until you pay for the upgrades. And then even that isn’t well thought out. It’s a shame they don’t show you the logical steps after purchasing. And now it might even be worse in that they’ve signed up with Lynda Courses. The courses themselves are fine, but if you’re not directed to the proper ones, and in the proper order, you will become very frustrated! Many of these programs use Facebook for their community. Unfortunately, it never works very well. That’s why I highly recommend Wealthy Affiliate. Their live community is integrated into their platform and is always busy with thousands of interactions each day. Your answers to your questions usually come within 1 minute. Thanks again for sharing. It’s always great to hear from someone who’s used the system. I researched affiliate marketing online for months before I found Wealthy Affiliate. I actually heard of Wealthy Affiliate in the past by reading blogs like yours where many recommended it. However, after researching I was convinced I had to pay thousands just to affiliate market, or learn how to, so I took a break from my research. Then, I received an email offer from yet another place where if you wanted to get more information, you had to upgrade to a package which was like a one-time payment of $1,997. Kind of crazy. After reading the review of that product, I came across WA again. I was drawn in because it gave me a shot to test the system before buying into the $49/month Premium. It was definitely a steal and now I’m glad I bought into WA, now heading into my fourth month. I have two niche sites, the latter of which I’m still building content for, and my first is growing at a steady pace. Hi Todd, and thanks for sharing your story. It’s amazing isn’t it, how you feel you need to pay a lot of money to get anything of quality. In some markets it’s true, but not always. In my years of experience, no one comes close to everything Wealthy Affiliate offers, for their one low price. And no surprise upsells, either. I’m not saying the expensive products aren’t any good, just that there no need to spend that much to learn affiliate marketing from experts. We are both living proof of that, aren’t we! I’m happy to hear you’re doing well. That’s what people need to hear. That Wealthy Affiliate WORKS! No, that six-figure program won’t work for me because it sounds like it’s for people who already have six figures in their bank accounts. Wealthy Affiliate sounds like a better option. You’re right, Rose. This is a pricey program for sure. Most newbies don’t have that kind of money sitting around, lol. That’s why they want to start making it online. This kind of defeats the purpose, doesn’t it, haha. Wealthy Affiliate is great. You should give it a try. It’s free to start. I wouldn’t bother with Six figure mentors unless you’ve got at least £10,000 to spend on their education. I spent £3000 with them over 3 years as a basic member and they teach you nothing you couldn’t learn for free. In that time I didn’t earn a penny using the education they offered. You pay $19.95 for your application, a one-off fee of $129 and that’s before you’ve even started. You then pay $97 a month, for nothing more than outdated videos and overpriced web hosting. Once you go through their Essential curriculum they immediately try and get more money from you by asking you to go Elite at $2500. The people are nice enough but the offer wouldn’t be so enticing if they weren’t. I wouldn’t waste your time with this company. I wasted 3 years and earned nothing. Then 4 months after leaving the company they took $97 from me, overdrawing my account and when I requested a refund they claimed I hadn’t cancelled as a member and I’m still trying to get back. Hi D, and thanks for sharing your experience with us. I’m so sorry you had to go through that. It proves that just because it’s a higher ticket program, it’s not of higher quality. And unfortunately, you’re not the only one who’s gone through this. I hope your comment will help people steer clear of this program, and I wish you all be best in getting your refund. If you get a chance, let us know how it went. Great post! I have seen Stuart on the youTube sidebar, and I found his presentation very enticing. However, like you, I found the program to be quite expensive. When I was searching for education on affiliate marketing, I thought that the cost was quite prohibitive for people who are looking to earn extra money. It seems like you have to spend a lot more than you can earn in those early months, and without knowing exactly what you are getting for your hard earned dollars until you pay. I found that the transparency of Wealthy Affiliate to be more to my taste. Thank you for this review. Hi Irma. You’re very welcome. I’m glad you enjoyed it. Yes, this program and many others online can sound very enticing. It takes considerable research to discover if it’s the program for you. Unfortunately many aren’t transparent to the disappointment of many members. Wealthy Affiliate tells you everything up front so you can make the best decision for yourself. Great post. Had never heard of it before and it sounds really expensive, especially for students. You have given it a thorough review, thanks so much for that. many reviewers just give a quick summary. You have gone to a lot of work. Thanks for your comment. I had to search a bit for this one haha. And I was blown away by the cost. I’m sure they offer good training, but unless you’re one of those people who feel a good education needs to cost a lot, it’s unnecessary! Wealthy Affiliate offers top notch education with all the tools and services included, without that enormous cost. Wow this is a very pricey platform. I had looked into SFM before but just felt it didn’t have a solid community backing. I’ll stick with your best alternative moving forward. Thanks for the honest advice Suzanne. You definitely can’t get a better community than with Wealthy Affiliate. I usually get help within minutes (if not seconds) after I ask. This actually sounds like a very interesting platform. I would definitely give it a shot but it is so expensive!! 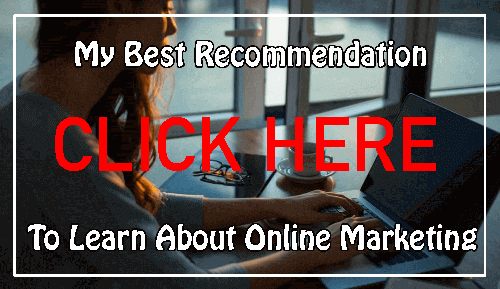 I completely agree with you recommendation for Wealthy Affiliate (as a member myself), it has provided me with everything I need to achieve success. Great review Suzanne! It was a very interesting read. Thanks Brendan. I’m sure it’s legit, but without having to join, there’s no way to know for sure. It was interesting that I couldn’t find any success stories online. Only promotional ads to join. Because of the high memberships fees and the fact they are giving you affiliate links and landing pages that will not rank with Google. Its as if they are already setting you up for failure. Great Review on SMF I have learned so much from this article thank you so much! Hi Kell. I don’t know too many new online marketers with that kind of money haha. There are better alternatives to learning a solid foundation without spending that kind of money. Wealthy Affiliate is the best one in my opinion. Hi LaKisha, and thanks for commenting. Yes, I can’t confirm why they’d want your personal information. Wealthy Affiliate doesn’t do that. I’m sure SFM has good qualities. But like you said, unless you have capital to invest, it’s alarmingly expensive. And being a Wealthy Affiliate member, I can say they offer all this plus more for only $359/yr premium membership. And no upgrades!! Hi Suzanne, I was reading your article and learned somethings. I have been in affiliate marketing for a short period of time. And, never knew that duplicating landing pages would not rank. You make an excellent point here. also, I have never heard of the six figure mentor but, glad you were upfront about what it had to offer and what it didn’t have to offer. I wonder why they want to know your personal income. Is because they want to see if you can afford their prices? I don’t know, I am sure that has to be an uncomfortable situation for some. I’ve heard good and bad about these high ticket programs. Usually, it seems like they are better only when a person has capital to invest and when they are experienced other that that I would not recommend this to be a way to start a business. I would go with your suggested Wealthy Affiliate because, well it is free and you’re right I or no one else has anything to lose…Thank you for sharing this..